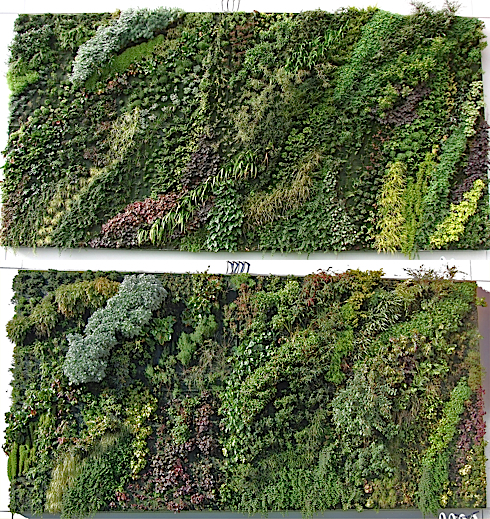 Patrick Blanc, a French botanist and artist, has been pioneering living murals of green. His hanging gardens can be found around the world. To plant this vertical garden, he begins with multiple layers of support which are then woven with irrigation. As the plants grow, the show changes from season to season. These two examples show the progression. This one is hanging outside a Goodwill store in Tacoma, Washington, the upper image was photographed several months earlier than the bottom. Found in the Caixa Forum in Madrid, Spain going from planting seedlings to maturity.